I don't know about you, but my mother-in-law started a tradition that I just love with her children and that I have passed down with my children. And that is getting a toothbrush in your stocking. I don't know why I loved this idea so much. Yes, my kids get toothbrushes at the dentist, but there are so many cooler options out there. That's why I am loving Firefly Toothbrushes. While instilling healthy oral care habits in children can be a brush battle to begin with, getting kids to brush for the recommended amount of time after holidays full of delicious food can be extremely challenging for parents. Firefly is the leader in children’s oral care solutions and offers fun toothbrushes in bright colors, with flashing lights and favorite characters that turn brush time into playtime! The flagship Ready Go toothbrush is equipped with a 60-second light-up timer that helps teach independence and guides kids to brushing for the dentist recommended amount of time – 1 minute for each row of teeth. The toothbrush is available in popular characters such as Hello Kitty, Marvel, Barbie, Angry Birds, and many others that kids love! Firefly also recently launched a brand new Star Wars Lightsaber toothbrush that features character voices, flashing lights and galactic sounds to encourage kids to defeat the dark side of cavities! Which has to be my favorite. Firefly will not only help parents teach their children healthy habits for a lifetime, but will also ensure that the kiddos smile big and bright for the New Year! Make sure to follow them on Facebook, Twitter, and Instagram to stay up to date with new product info and other fun stuff! Do you like to give toothbrushes as stocking stuffers? What do you think of Firefly Toothbrushes? I received complimentary products to provide this post. All opinions are my own. If you would like to see your products featured in our 2015 Holiday Gift Guide, feel free to contact us. I've seen the Fire Fly toothbrushes and wanted to get three for my kids. They look fun and my kids will love the action characters. I also like the light up timer. My kids would finish brushing their teeth a lot sooner. My son is 16, so he's a bit too old for these now, but he is tooth brush fancy. He's always gotta have the best of the best. I'm very greatful to have a son that has excellent personal hygeine. When he was younger the jazzy toothbrushes definitely helped encourage him. 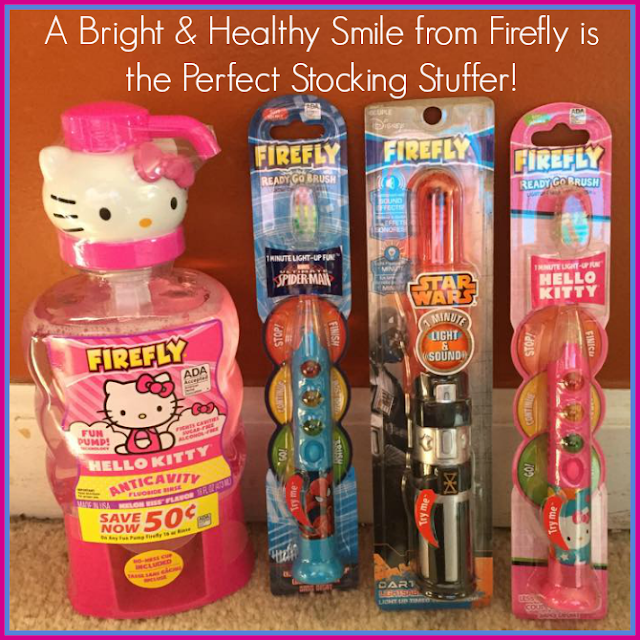 My kids often get tooth brushes in their stockings, these would be perfect for this year! I love that it helps my kids brush for the right length of time and they would love all the fun characters! These toothbrushes are super cute! It will make as a perfect stocking stuffer for little kids. It can easily motivate kids to brush their teeth twice a day. These are cute stocking stuffers for kids. I'm ornery. I'd probably give this to a few adults as well! HA! I absolutely adore the Firefly toothbrushes. They are so unique and fun for kids. I love that they have bright colors and fun sound effects!